Home » Where Are They Now? » 2013 WHERE ARE THEY NOW? Cayla Pellegrini from Pinkerton Academy class of 2010, started cross country as a freshmen on the JV team. She showed early talent running times of sub 21:00 for 5k, but struggled with minor injuries her first couple seasons. By her junior year of high school she emerged as a leader, helping her team bring home a 2nd place finish at the Class L (now DI) Championship in an unlikely rebuilding year for Pinkerton. 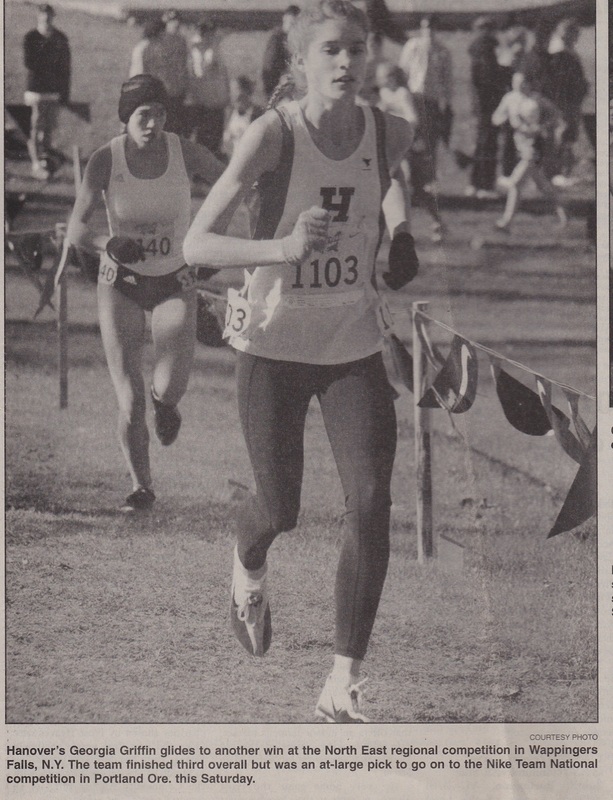 Her senior year she led the team as their top runner, running her high school personal bests of 19:07 for 5k, 5:07 1500m, 10:56 3000m, and 11:28 in the 3200m. These were solid times, but her coaches always knew that she was capable of more, as she continued to be held back by occasional minor injuries and not able to increase her total volume of training. Now at the collegiate level, she is excelling as a top 7 runner at Division I, University of New Hampshire. Some of her personal bests include 17:40 in the 5k, and 36:51 in the 10K. One of her strongest attributes, as a runner, is that the harder the course and conditions, the tougher she runs. What is it like to race at Derryfield Park? Going into my now 4th year of collegiate racing and having raced in places all over the country, I still hold a special place in my heart for Derryfield. Even now thinking about toeing the line for Class L’s (now D1), I still get butterflies in my stomach because it brings back such awesome nostalgic memories of all the great races I have had on that course. What I like the most about Derryfield is that it is a true New Hampshire race course. It has grass, it has some pavement, it has some dirt trails, and of course it has some hills. Not too many courses are directed up the side of a ski slope, and that is what makes competing at Derryfield so much fun. I can remember rounding that door on the grass before making the turn to the homestretch and just being carried by the energy and excitement coming from the fans. It’s an awesome experience some of my greatest and most memorable races are from racing on that course. Describe your most memorable moment running cross country both in high school and in college? My most memorable moment from high school is probably racing at New England’s my senior year (2009) at Wickham Park. Right before the gun went off, the skies just opened up and it was absolutely down pouring. The course had puddles that were a foot deep and there was not one section of the course that wasn’t completely covered in mud. Runners were sliding out in all directions and it became a race more focused on staying on your feet rather than running a good time or placing well. I love running in wet, muddy conditions so I had a blast running in that race and it’s something I will never forget. My most memorable moment from college thus far was running at Pre-Nationals in Louisville, Kentucky last year. Being able run in a race with some of the fastest and biggest names in collegiate cross country was an experience I will never forget. As I was warming up for that race I can remember just feeling the energy buzzing through the crowd, it was crazy. And then being able to toe the line right next to Jordan Hasay and Alexi Pappas and all of these amazing runners was just an unbelievable experience. What was your favorite high school work out? I am a fan of longer intervals and hills so anything that combines the two of those things is sure to be a good workout for me. One that stands out in particular was when we would run over to Alexander Carr hill and run some hard miles and do some hill repeats. Not only did it work on your physical training but workouts like that help to make you mentally stronger as well. During your four years of running at Pinkerton Academy, you have grown as a runner, not only physically but also mentally. How did your years at Pinkerton set you up to be successful in college? from running on the JV team to being Pinkerton’s top runner by my senior year and it was gratifying to see that all the hard work, training, and dedication I put in over the years had paid off. My high school coach, Amy Bernard, is to this day one of the best coaches I have ever had and she was just as dedicated to helping me grow as a runner as I was about my own training. Having someone so passionate about coaching you really motivated me to step my training up and I owe a lot of my success to her. What are your plans for the future? Do you plan on continuing to run competitively? After I graduate this year, I plan on pursuing a job in physical education and maybe coaching a cross country team of my own. Eventually I would like to go back to school to get my Masters down the road. Running will always be a part of my life after college. I plan on continuing to run in road races and possibly join a racing team. I also would like to train for a marathon at some point. That is one thing that I definitely would like to accomplish. Running for me is an outlet to just let myself go for a bit and forget about the stresses of life and I look forward to a good long run, so running will always be a part of my routine, even after I am done running competitively. Do you have any advice to share with current high school cross country runners? My advice to current high school XC runners is to just have fun. Running is a very simple sport to train for; all you have to do is put one foot in front of the other. It’s that simple. Runners don’t become good because they bike, or because they swim, or because they did 30 minutes on the elliptical. Runners get good because they lace up and go for a run. So many kids are focused on going above and beyond trying to get good, when the best thing any runner can do to get better is to run with a purpose. And most importantly, never say never. If someone came up to me in high school and told me I was going to break my high school PR by more than 3 minutes in a few years, I probably would have laughed at them. It was only until now that I realized that back then, I had no idea of the runner I would one day become. Set goals, train hard, and run with passion. Run because it is something you want to do and that you enjoy doing. And last but not least, dream big and then dream bigger. Georgia recently graduated from Stanford University with degree in Earth Systems. Georgia’s high school xc career was nothing short of spectacular culminating in an athletic scholarship to Stanford. Georgia ran cross country at Hanover High for three years, leading her teammates to three consecutive #1 rankings in the state and eventually a 4th place at the Nike Cross Nationals. Her accolades are too numerous to mention, but some of the highlights were: 3x Class I Champion, 2x Meet of Champion victor, 2x New England Champion, and Northeast Regional Champion. During her junior and senior year she was named Gatorade Runner of the Year for NH as well as NH Runner of the year. Her personal best at Derryfield Park is 18:01and a record breaking 17:28 at Mine Falls. You played soccer as a 9th grader, why did you decide to run cross country the following year? I realized that my favorite part of soccer practice and games was when I got to run a lot. I have always loved to run. Describe racing at Derryfield Park. Just like every other race, the hours, minutes, seconds preceding the starting gun were a whirlwind of nerves—and routine. Maroon! Crush! As a pack we would do our final stride back to the starting line, tear off our sweats, exchange breathy good lucks and hand squeezes, and toe the line, shoulder to shoulder with teammates. In the mere seconds before the gun and the sea of runners broke loose, I focused my mind on what I needed to do. Moments later, it would just be running. My strategy at Derryfield was the same every time I raced there. The first mile I envisioned myself floating comfortably along—ideally in the front pack or just behind. I loved the idea of music blasting as you run up the first hill. But once the race began, I never even heard “Girls Just Want to Have Fun!” or “Chariot’s of Fire” playing that people talked about afterwards. I would make a strong move heading into the woods and by the time the trail hung a left I hoped to be out of sight. In the winding section of wooded trail I felt like I could open up my stride and put in a stretch of hard effort while nobody could see me. I tried to create as large a gap as possible between myself and the next runners during this section. Then I would just relax and maintain up the steep ski hill, and start rolling as I hit the flat hilltop and ran down, relaxing as much as possible. The 5th kilometer of the Derrifield course is a grueling—albeit slight—incline that snakes back and forth so that you can see other runners at different points in the race. When I hit 4 kilometers, I just tried to “hold on,” encouraged by the cheers, the glimpses of teammates I caught while rounding a corner, and by knowing this would last less than four more minutes! My favorite memories of xc are the rituals. For me, they turned being part of the Marauder team into something sacred. Eating watermelon after preseason workouts; pre-race visualizations at the Bima; team dinners; yoga breaths led by Mrs. Eakin of course mid-run; the Abanaki Warrior Hill Workout and the Marker Game; belting out “Build Me Up Buttercup” and “Ain’t No Mountain High Enough” on the bus and while running; doing skips to “Sweet Caroline” while warming up; Mr. Eakin clamping his hand on each of our necks before the race; Maroon! Crush! These rituals were part of our identity. When other things got tough, like relaxing the night before a big race, little traditions fed me confidence. I loved the surprises. For example, when Mr. Eakin would spontaneously tell us to sprint up a hill at the end of a workout, with very little forewarning. Since Mr. Eakin, I have never had a coach incorporate surprises into a workout without an explicit warning that there might be a hard addition at the end. I think it prepared us to be adaptable and not panic when the going gets tough and deviates from expectation. As you developed into a champion runner, did you feel a pressure to be #1, and if so, how did you handle that pressure? Honestly, it was a lot easier to deal with pressure in high school than in college. I think that one reason for this may be that in high school the pressure was internal and focused around trying my best, while in college I felt external pressure that was more results-oriented (whether or not that external pressure was real or perceived). In high school, I believed that I could be as tough as any of my competitors, and that gave me strength. training, competing, relationships with teammates/coaches, balancing running with college course work, etc. Both my cross country team in high school and my team in college were like family. Some people might think of running as an individual sport, but cross country is all about the team. My teammates are some of my closest friends, and truly wonderful people. One major difference between high school and college cross country is the support of one’s family while living at home. I have come to appreciate how much my parents and brother, and my friends’ families gave to me—everything from home-cooked meals and making daily life easy to providing unconditional love no matter what the result. What are your future career plans and will you still compete as a runner after college or do other sports? I will be spending this coming year in Cochabamba, Bolivia, volunteering in a children’s home. So I have been preparing myself for the challenge of not being able to run. In the future, my goal is to attend medical school, possibly become a pediatrician, and own a very large blueberry patch. After struggling with some injuries the past three years, I am finally healthy again and able to run care-free, and it has been a blast. When I return from Bolivia, I hope to run with friends, maybe join a club running team at some point, and definitely play lots of other sports! I think one of the greatest things about running xc is that you learn things about yourself that nobody else can teach you. So my advice might not be so relevant to another high school runner! That said, if I could have given myself advice when I was a senior in high school, heading on to race in college, I would have told myself (1) being happy is a prerequisite for running well (2) it’s OK to be content even if not satisfied (3) often less is more in distance running, and (4) trust yourself—just because other people do things differently, you know yourself.